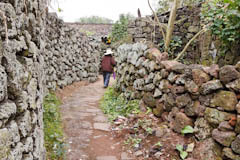 The entire Rong Tang Village (荣堂村) is made of volcanic rock. It is around 900 years old. Most of the residents have moved out long ago. A few elderly people remain. The houses of the wealthy were made of larger pieces of lava stone while those of poorer families used smaller pieces. There was a shortage of water in early times so each household had large water vats. The wealthy had a larger number of vats than the poor. At the entrance to the village is a cave system formed when the volcano was active. Many of the caves are interconnected and the longest is about 3 kilometres. The old lava tubes were used as a hiding place from the Japanese during the war. Catch a bus to No 14 Middle School (市十四中). No 1, 2, 7 and some others go here. Walk back to Xiuying Avenue (秀英大街) and cross to the other side. Walk in the same direction as the traffic and you will come to a bus stop. Take a mini bus from here to Shi Shan Zhen (石山镇). The mini bus Costs 4 Yuan. The bus will stop at the entrance to the volcano park. Don’t get off here. Stay on the bus to where it terminates in Shi Shan Zhen. Rong Tang Village is about 400 metres north of the government Office in Shi Shan (石山镇). After getting off the bus, walk down the road in the same direction as the bus was going. You will come to a fork in the road. Take the road on your right and soon you will come to the village entrance. The cave system is on the right just before the village. Some locals will soon be asking you for some money to take you through the cave system. It is also expected that you will pay a local to show you around the village.